Grazing is an important driver of ecosystem functioning! Not only in seagrass ecosystems :). This paper is a result of a very nice collaboration with Liesbeth Bakker and other colleagues working on herbivory in other ecosystems. In this paper we show that herbivores provide strong top-down regulation on freshwater macrophytes and seagrasses. Their effects are strong! Herbivores remove on average 40–48% of plant biomass in aquatic ecosystems versus 4–8% in terrestrial ones. Herbivores have strong direct and indirect effects on aquatic ecosystem functioning. With ongoing global environmental change, herbivore impacts are predicted to increase. New tools and functional classification of aquatic herbivores will advance understanding and prediction of their impacts. 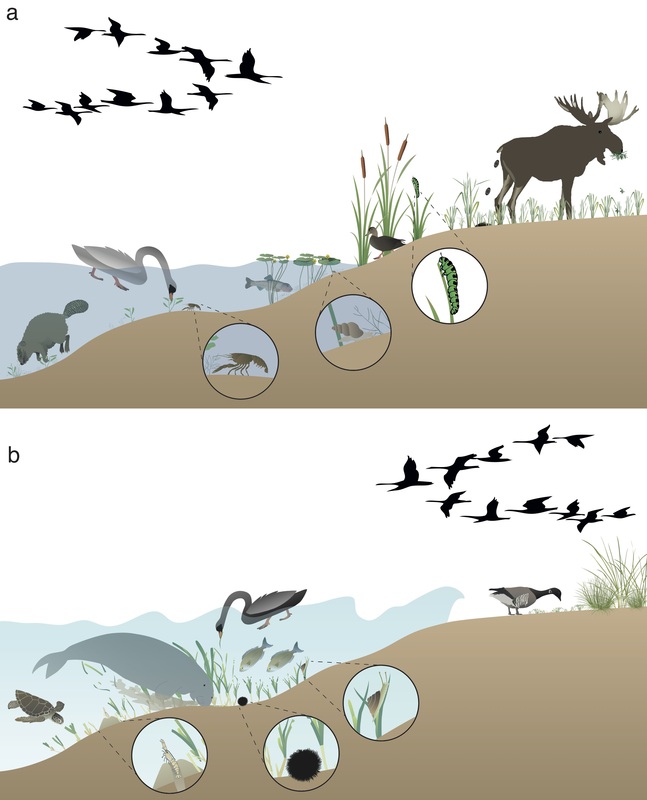 Synthesizing scheme indicating the effects of herbivores on macrophyte beds and the functioning of shallow freshwater (a) and marine (b) aquatic ecosystems. Herbivores affect plant abundance and species composition by grazing and bioturbation. Their presence alters biogeochemical cycling and primary production, they transport nutrients and propagules across ecosystem boundaries, modify habitat for other organisms and affect the level of shoreline protection by macrophyte beds.